You look kind of nervous. Probably your first hostage rescue, huh? (SPOILERS) The chances of making a genuinely insightful, acutely satirical Hollywood movie relating to US interventions abroad, political and military, seem minimal these days, so you might as well go back 25 years to the flawed Wrong is Right. What we have seen most recently appears acknowledge this: desperate attempts to make feel good hay from loosely factual material (“inspired by”), to disastrous effect, both creatively and commercially. 2015 saw Our Brand is Crisis and Rock the Kasbah, both based on documentaries, both plotting uplifting, redemptive tales of self-realisation for their jaded, cynical protagonists when they’re confronted by the realities fostered on other nations by their home one. Although, reality couldn’t be further from Rock the Kasbah’s Afghanistan (filmed in Morrocco), which has about as much legitimacy as The Men Who Stare at Goats’ Iraq (there at least, the heightened sense was part of the point). Taking 2009 doc Afghan Star as a starting point, Mitch Glazer (a Bill Murray collaborator as far back as Scrooged), grafts a tale of a past-it, white American rock promoter (Murray) onto the factual tale of a taboo-breaking, death-threat receiving female talent show contestant (Leem Lubany), whereby, through shepherding her to the stage, he righteously challenges the country’s religious mores, and her family, and Afghan warlords, so bringing western values of hope, freedom and decency to the country in a softer, more inclusive, less blow-it-to-hell, more Murray-esque way; if only he could be the US Ambassador everywhere. About the only surprise here is Lanz getting shot mid speech to the warlord, but even that’s doused in life-affirming fairy dust. But nothing can distract from how leaden the whole affair is while being immensely patronising to just about anyone willing to sit through it, possessed as it is of the kind of oblivious mind-set only an ivory tower in the Hollywood hills can produce. Perhaps Murray and Glazer were looking for some of that inspirational Slumdog Millionaire magic? Who knows (given how Lubany barely gets a look in, probably not). 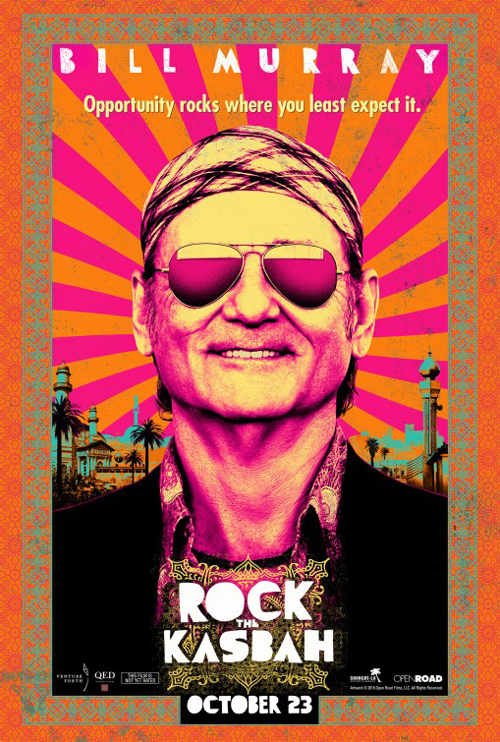 It’s no surprise Rock the Kasbah was a bust, though, one that made more headlines for how low its opening gross was than even how rotten its reviews were. Murray’s rendition of Smoke in the Water, designed to be awful, admittedly, is some kind of tone-deaf movie nadir. If Lanz had been shot then and there, at least the picture might have mustered some kudos.